Shoes are also very important. The Flamenca dress is always accompanied by high-heeled shoes, in keeping with the very feminine spirit of the dress, since a high heel always flatters the figure. No matter whether it measures 2 cm or 10 cm, every woman knows what she’s used to wearing, and how long she will have to wear them in El Real. Generally she will cho ose a medium heel – about 4 cm – which is comfortable and elegant at the same time. Traditionally the shoe has always been the same style, varying only in the colour, black or red, to match the colors of the dress or accessories. It is a very simple style with no big adornments. However, in recent years the trend, especially among younger girls, has been towards a type of espadrille wedge, also about 4 cm high, more comfortable, and also very pretty, but simple, always discreet. The shoes should never be the protagonist, but they should not detract from the overall look of the outfit, and never, under any circumstances, should you neglect them, for if you are lucky enough that your partner takes you up behind him on his horse, you will sit sideways on the rump, with your legs hanging down the side of the horse, and the first thing that everyone will see will be your shoes! So what name do we give to the dress? 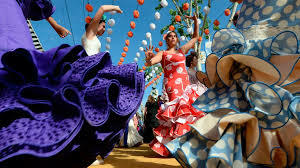 Usually it is called “Flamenca” because it is so intimately linked to the art of the dance “Flamenco”, although it is also known as “Traje de Gitana” or Gypsy Dress. 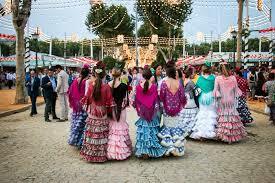 However there is one more name which you might hear “Traje de Faralaes” (literally, a dress with flounces), but please never use it, as to a woman from Sevilla it sounds insulting and vulgar. So, it doesn’t matter whether you are fat or slim, if you are tall or short, young or old, have big eyes or small… you will always look perfect dressed “de Flamenca”! In my personal opinion (and here I am probably going to offend some people!) only women who have been born in, or have had some link with Andalucia from childhood, have the “gracia” (elegance) and “salero” (charm) required to wear a Traje de Flamenca and look comfortable and natural – as opposed to looking like they dressed up for a Carnival Party, and of course this is absolutely not it at all. 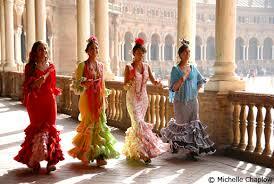 But what is the real secret of why women dressed “de Flamenca” look so spectacular? THE SMILE. You will never see a woman looking tired, angry, or uncomfortable, even if they are. They keep their smile all the time, and not only in El Real de La Feria, but in general, in our everyday life we are all of us ALWAYS attractive when we smile!! Author´s Note: “I want to say thank you to Diana Rodríguez who kindly help me in translating and organizing the text into a proper English”.